Securely sharing files with selected persons using Cyberduck is easier than you might guess. 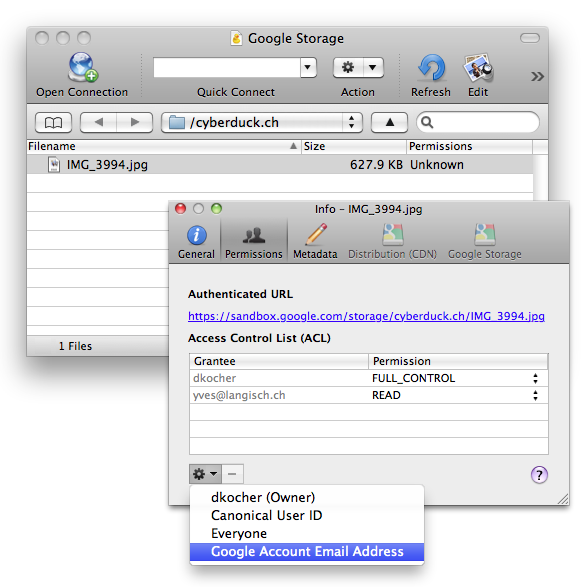 Using Cyberduck, you can grant access to files stored in your Google Storage account selectively to anyone who has an email address registered with Google. Browse your Google Storage account by opening a new connection with Cyberduck. Upload the file you want to share and select File → Info. Choose the Permissions tab to edit the access control list (ACL) of the file. Choose to add a grant for an Email Address from the ACL tool menu. Enter the email address registered with Google of the person you want to grant access to the file. Choose READ for the permission drop-down menu. Copy the Authenticated URL above the ACL table in the Info window starting with https://sandbox.google.com/storage/ and share it with the person you want to give access to the file. The link will redirect to the file only after the user has successfully logged in to their Google Account and is listed in the ACL you have just edited.